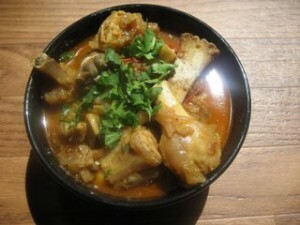 Bong Baray Paye recipe by Nazia at DesiRecipes.com. If roasted pias(cow leg) are not available. Roast them over open gas flame. There is a bunch of hair between the hooves. With a sharp knife make a long cut between the hoof and carefully remove hair. Wash pai thoroughly under running tap and scratch any burnt part with a sharp knife. Wash the bones under cold running tap. Place pai, bones and all the ingredients for stock in a large heavy based sauce pan. Bring to boil, reduce the heat, cover and allow to boil gently for about 3-4 hours until meat is almost tender. (The process can be speeded up in a pressure cooker. Use half the quantity of water. Meanwhile prepare the gravy. Heat oil in a large heavy based pan and add sliced onions. String frequently fry for 5-8 minutes or until onions are transparent and soft but not brown. Add garlic and ginger paste and continue frying for another few minutes. Add a little stock to prevent the mixture from sticking to the bottom. Add the turmeric , chili powder, coriander powder, garam masala and salt . Stir fry for another few minutes. Add a little more stock if mixture sticks to the bottom of the pan. Remove pais from stock and add to gravy. Add 12 cup stock and stirring frequently fry for 10-12 minutes. Add little more stock to prevent the mixture from sticking. Turn off heat, carefully remove pai from gravy, and put them back in the stock. Place it over medium flame and bring to boil, reduce the heat to low. Cover and cook until the pai are very tender and soft and about 8-10 cups of soup is left. Reheat gravy, add meat to it and stirring frequently fry for 12-15 or until meat is well browned. Add little water if while frying meat stick to the bottom of the pan. Add 4 cups of water to meat, cover and cook over low heat (stirring occasionally) until meat is tender and oil begins to separate from the gravy. Turn off heat. When the payas are very tender and soft, add beef mixture to it. Carefully stir once and cook for another 5 minutes. Don't over stir otherwise meat pieces will break. Serve hot with Nan or tandoori roti.